How many of you love Rae Dunn’s dishes and other household items? If you do, you’re going to want these super cute ornaments for your Christmas tree. Get these Rae Dunn-style Farmhouse Ornaments for $6.99. The designer inspired font on these glass ornaments are the perfect personalized accent for any tree. They make fantastic gifts for friends and family. These can even be made and used for other holidays, not just Christmas! There are 48 options available, and there are so many that I want that I think I’ll need a separate tree just for these ornaments! Grab these fun Rae Dunn-style Farmhouse Ornaments while they’re on sale! Hate waking up in the morning to your glaring alarm clock beeping loudly? There are some great alarm clocks on the market that make it easier to wake up just like these Gentler Alarm Clocks starting at $21.99. 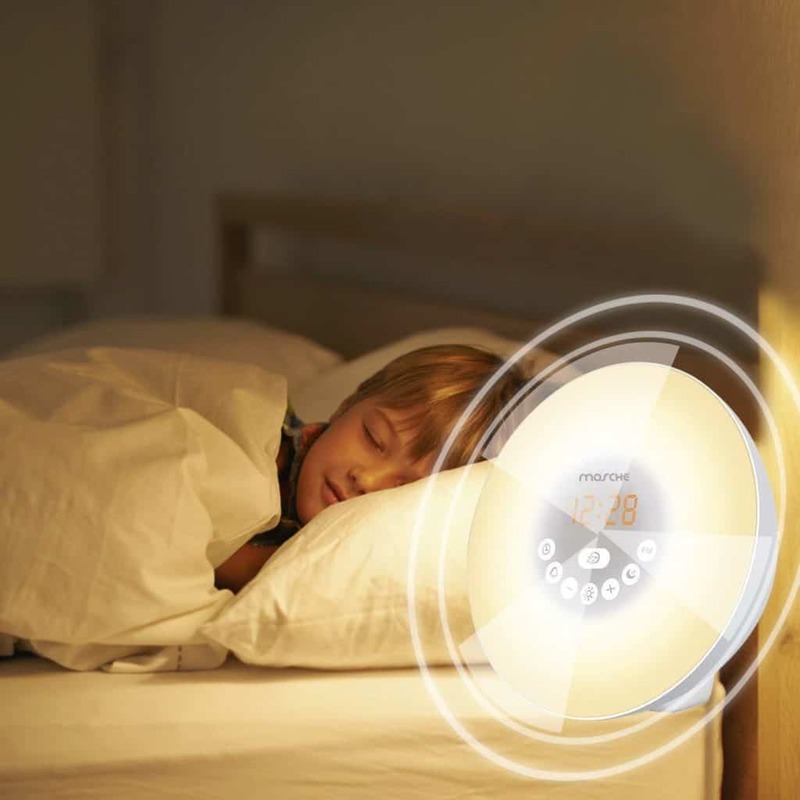 This Philips Wake-Up Light Alarm Clock has fading night light dimming sunset and sounds to help you fall asleep and a colored sunrise simulation alarm clock to wake you gradually with a natural light lamp. This is on sale for $104.99. 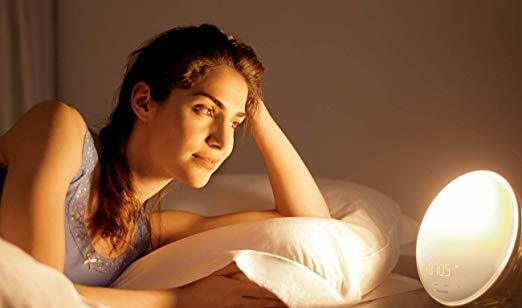 Wake up to nature sounds with the Sunrise Alarm Clock. 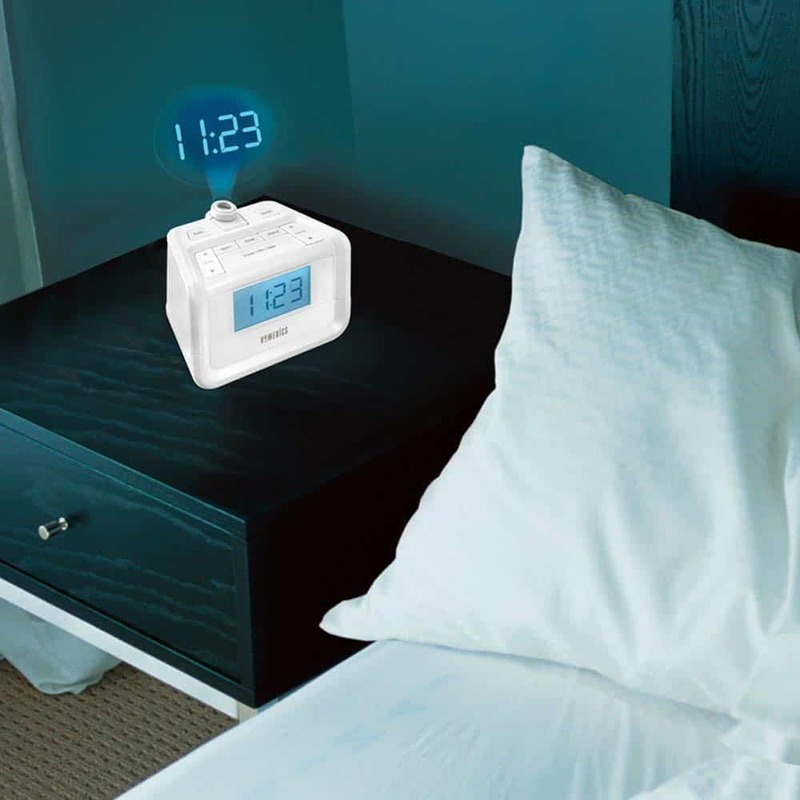 This clock features six nature sounds, FM radio, and adjustable brightness that gradually lights up in the morning to bring you out of a deep sleep gently. Get this clock for $25.16 when you clip the 6% off coupon located below the price. 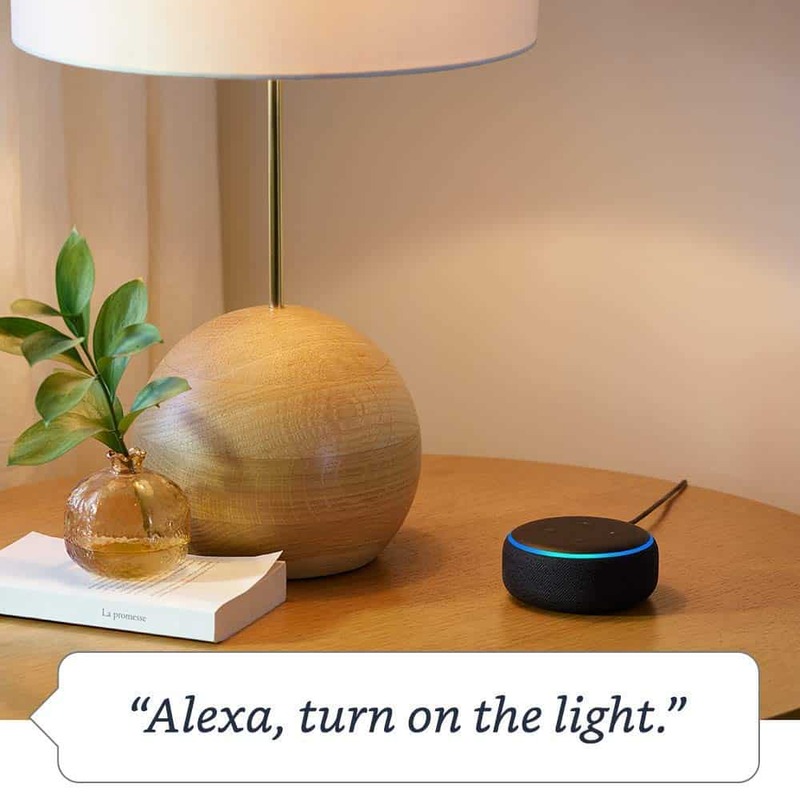 The Echo Dot not only can wake you in the morning with an alarm but, if you have smart light bulbs in your home, you can turn the lights on without getting out of bed by telling Alexa to turn them on. The Echo Dot is priced at $49.99, and you can make monthly payments of $10 if you want. 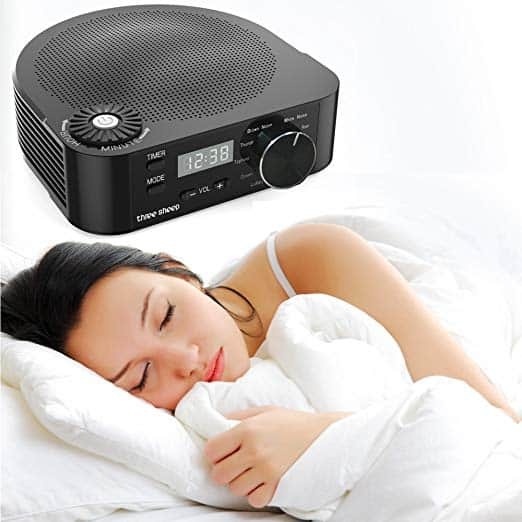 With this Dual Alarm Digital FM Clock Radio, you can wake up to your favorite radio station, peaceful nature sounds or a beep tone. I love all the different sound options available as well as the price – only $29.97. 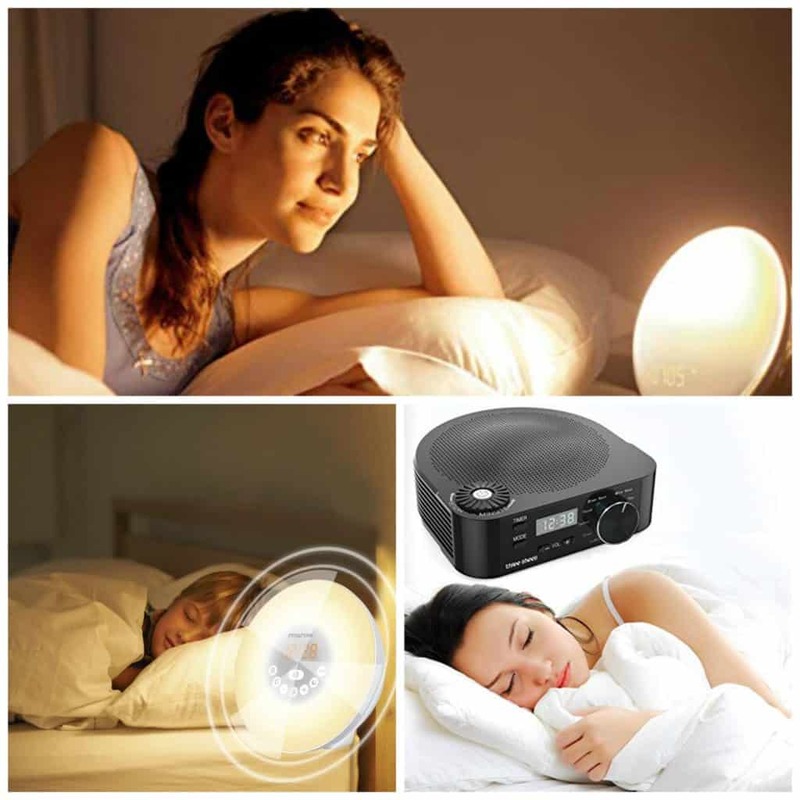 The three sheep White Noise Machine comes with 10 different sounds to help you fall asleep, like brown noise, white noise, rain, bird, brook, lullabies, ocean, typhoon, or thunder. This machine doesn’t have an alarm clock and is on sale for $21.99 when you clip the $5 coupon located below the price. 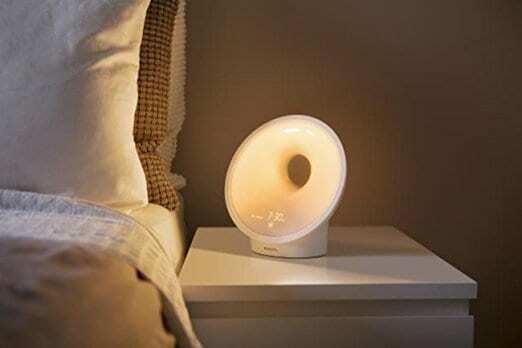 And, the Philips Somneo Sleep and Wake-up Light Therapy Lamp has a sunrise alarm clock that is clinically proven to improve your energy, sleep and well-being. Grab this for $179.95. If you use a space heater at work or at home to keep warm during the cold months, or if you don’t have one but have looking at getting one, this is a great time to buy! Today only, you can get Portable Space Heaters on sale for as low as $27.99. This Tenergy PTC Ceramic Heater has an auto shut off feature with an adjustable thermostat – perfect for use in a bedroom, office or any other room where you need it. This is on sale today for $27.99 (reg. 40). POWERFUL AND COMPACT WITH A MODERN LOOK – The Tenergy 900W/1500W Ceramic Personal Heater has a lightweight portable design where its coils will heat faster to generate quick and even heating throughout the room. CONTROLLABLE COMFORT – With a 15° degree fan tilt, direct air up towards your preferred area with Fan-Only/ Low-Heat (900W)/ High-Heat (1500W) functions that let you control the hot air output. The additional adjustable thermostat can be set to maintain the desired temperature in your room. This is one of the best portable heaters for home, office and bedroom. BACKED WITH SAFETY – The Tenergy Personal Heater has an automatic shut off feature to prevent overheating once the electric fan heater senses an internal temperature of 179.6°F (82°C). QUICK HEATING FOR INSTANT WARMTH – Using a ceramic heating element, the fan-forced heater begin to get hot within 3 seconds to generate a fast amount of heat to reach the desired temperature. ETL CERTIFIED & 2 YEARS EXTENDED WARRANTY – Built with flame-retardant case and premium circuitry, this heater meets the rigorous safety standards of ETL. Register your Tenergy Ceramic Heater to receive 2 years extended warranty and lifetime support from our friendly customer service. 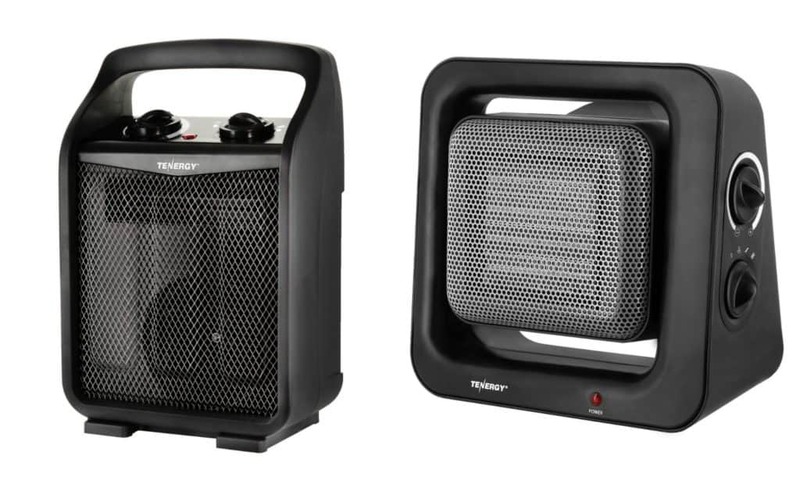 If you want a heater with more features, you’ll want to get the Tenergy 1500W/750W Portable Space Heater. This is on sale for $31.99, and features an adjustable thermostat, recirculation air electric fan heater, an auto shut off switch, and tip-over and overheat protection. SPACE SAVING FRONT INTAKE AIR DESIGN – The Tenergy Portable Fan heater features a front intake air design that allows the heater to be placed against the wall without heat buildups. *Recommend for room size under 170 sq. ft. POWERFUL FAN HEATER FOR INSTANT WARMTH – With its compact design, the fan is able to disburse hot air quickly with a rate of 4.5m/s (14.5ft/s), double the rate compared to most heaters to give the fastest heating to reach the edge of the room. CONTROLLABLE COMFORT – Designed to fit your heating preferences, the portable heater is outfitted with Fan-Only / Low-Heat (750W) / High-Heat (1500W) options. The additional adjustable thermostat knob maintains the desired temperature for your room once it is reached. 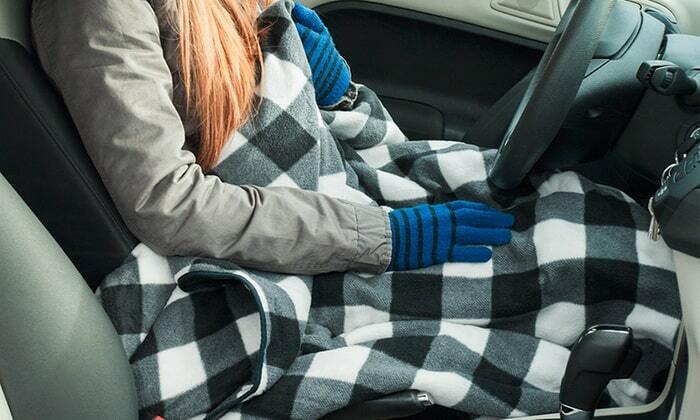 BACKED WITH SAFETY – Using premium circuitry, the heater will automatically shut-off in the event of a tip-over or overheating (internal temp: 179.6°F), preventing accidents or damages from occurring. One of the most portable heaters for home, office and bedroom. ETL CERTIFIED & 2 YEARS EXTENDED WARRANTY – Built with flame-retardant case and premium circuitry, this portable electric space heater meets the rigorous safety standards of ETL. Register your Tenergy Portable Fan Heater to receive 2 years extended warranty and lifetime support from our friendly customer service. Get your Portable Space Heaters while they’re on sale today! Mules are such great shoes because they slide on and off easily and look cute with pretty much any outfit. These Woven Mules are available in three colors for just $24.99 (reg. $60). This designer-inspired mule features an open weave design, lightly cushioned footbed + easy on/off style. You can pair these with anything from dresses and skirts to your favorite skinny jeans or leggings. These are bound to be a staple to your every-season wardrobe. Grab these trendy Woven Mules while they’re on sale!